Proudest Moment - holding the Olympic torch accompanied by my two children, Joshua aged 11 and Emily aged 6. Friday 6th July will live long in my memory, one of the most amazing days in my whole life. The nervousness, the excitement, the buzz, the worry, the thrills and the highs all rolled into one – a truly magical experience. Late on Thursday night myself and my partner set off on the long journey from the South Coast to Hadleigh. With my pristine, shiny white Olympic tracksuit stored safely on the back seat of the car, I headed off into the unknown. After a relatively straightforward journey up, we headed to the site of the torch tour, the place of my handover and took note of the route I would be taking the next day. Happy I knew where I was going, I then retired for the night, full of excitement and a hint of trepidation! After watching the weather forecast for what seemed an eternity, we worked out the sun may just shine at the time of my run, although I worried the white suit may have gone a little see through long before this point with the amount of rain forecasted! I was naturally excited as we headed to the meeting point. As I arrived at 11.20 am it was somewhat reassuring to see 17 other torch bearing members of the public looking and feeling equally scared of what lay ahead. After sheltering from the rain and registering we shared an amazing time, telling each other of the reasons for being nominated to run with the torch and hearing inspiring stories from the wide variety of ages and cultures on show. After the opportunity for a few last minute words of encouragement from attending friends and family, the moment was upon us to get on the bus and head out to meet the public. We all sat on the bus thrilled by what we hoped would be an amazing experience – I can tell you now, we were not left disappointed! …. I nervously stepped off of the bus with my torch to be greeted by 12 of my family and friends and hundreds of well wishers. As I waited for the torch to come to me, I was inundated by the public all wanting to know who I was, why I was there and have their photo taken with me and the torch. After a pre-run chat from our host Holly, who looked after us all extremely well, we were off into the town centre to have our moment of fame! As the heavens opened the first torchbearer out of the 18 on the coach was off and the day was underway. I wasn’t running until 3.06pm and the first runner set off at 1.00pm so there was plenty of time to get nervous. As the convoy looped through Hadleigh we were all feeling like celebrities, waving back at the public who took us to their hearts. The streets were lined throughout the day with flag wavers and people cheering from young children to the more ‘mature’ fan. The turn out was unbelievable, none of us could quite believe all these people had come to see us carry the torch and transport the flame on its historic journey. After a brief stop back at our starting place, we were back off and my moment was almost here. At 2.55pm I nervously stepped off of the bus with my torch to be greeted by 12 of my family and friends and hundreds of well wishers. As I waited for the torch to come to me, I was inundated by the public all wanting to know who I was, why I was there and have their photo taken with me and the torch. After a few brief instructions, my moment was upon me. In a flash the worlds media were focussed on me and after the flame was handed over I stood alone, the only man in the whole world with the Olympic flame. To say I felt honoured would be a big understatement. I was truly blown away by the moment, the crowd and everything that went with it. The sun had come out and it felt like everything was going my way. 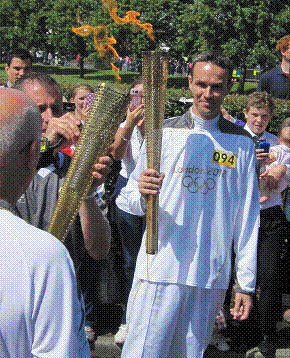 After a smile and a wink to my kids, I started my short journey with the torch. I walked at first then broke into a jog from the bulk of the leg. The crowd were amazing, shouting my name, waving, clapping, cheering. It was without a doubt one of those moments I will remember for the rest of my life. I handed over the flame to a fellow runner, the gas was turned off and I was back on the bus – my moment was over, but it will stay with me forever. The run took only a couple of minutes, but it felt like a lot longer. I got through the moment without dropping the torch, without tripping over and everything went to plan – these things go through your head in the moments before the run so it was great to do it so well and enjoy it so much. On the bus after, while the remaining torchbearers carried out their legs, I took a moment to soak up the day, the atmosphere and the shear enjoyment I had experienced. This was a moment only 8,000 people will be able to say they did and I was fortunate to be one of them. This day was as much for my friends and family who have been there to support me and my charity work as it was for me, so it was great that so many wonderful people were able to share it with me. When the day was over and we had swapped photos and memories with the other torchbearers, we headed home to Brighton. The whole way home the smile remained on my face, somewhere it stayed for several days. The experience is almost impossible to describe. I have said it’s second only to the birth of my children in terms of greatness. This was the day where I got my 15 minutes of fame – TV, radio interviews, photos with the public – it was a time where everything went well and everyone was happy. I felt truly blessed to have run with the torch, the symbol of such a great institution, in such a lovely part of the world. This was my moment but it was only possible because of such support from the public, for which I will be eternally grateful. As the days have come and gone since the 6th, I have been lucky enough to see the torch come to my home town (Brighton and Hove) and help out on two legs of the tour. I have been able to talk to people and share my memories. To say “I carried the Olympic torch” is something very few people can say, yet so many would love to do. 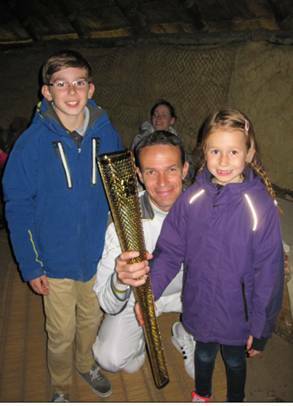 I have been into a host of schools over the past fortnight sharing my experience and showing the torch to hundreds of children. These past weeks have been a whirlwind, they have been humbling and exhilarating, thrilling and breathtaking. I feel like one of the luckiest people on earth and like the torch I am lucky enough to keep, it will stay with me forever. Editor’s note: In his home town of Brighton & Hove, Alex supports his community in many ways. He helps to raise funds and awareness for the Royal Marsden Cancer Charity into research for a variety of cancer cures. He’s a steward for ‘Race for Life’ runs, he’s raised funds for the Rockinghorse charity (respite care for sick children) and has worked with schools as part of the National School Sport Week.